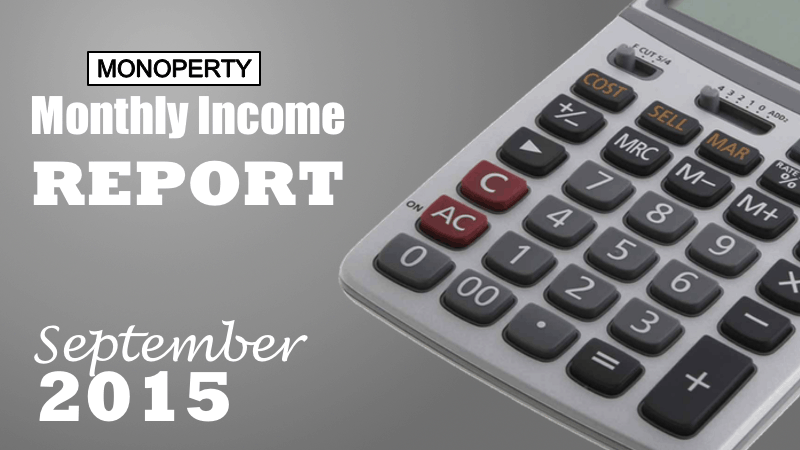 Welcome to my monthly income report for September 2015! September 2015 was a good month for me as I started to receive rent from my 2nd renovation project (Property 2), which had been on the rental market since May 2015 (far too long). My main learning this month is to always ask the letting agent for their fees in writing. In my ‘Things To Consider When Searching For A Letting Agent’ post, I wrote that from 27 May 2015, letting agents must publish full details of their fees and charges for both landlords and tenants, on their websites and in a prominent position in all their offices. I wasn’t aware of that change to the regulations when I spoke with my letting agent (July 2015), but I obviously asked them what fees they charged. They told me they charge a set up fee of £195.00 + VAT per room and a monthly management fee of 15%, which I was happy to pay. The total cost of those fees fall into the guideline of between 2 – 4 weeks rent for a full management service. This resulted in unexpected charges totalling £60.00 and a debit balance of -£36.17 per room on my first statement. This exceeds the guideline mentioned above. More on this later. Not good! Had I not received my unexpected charges of £60.00 per room, I would have received a net income of £150.53. When I write a post, I start by writing about my own experience and then, depending on the topic, I carryout out some research on the subject to make sure I’m delivering the best, and up to date, content to you. In creating this blog to share my journey, it is helping me to improve my knowledge. The issue of unexpected fees is a perfect example. I have contacted my letting agent to ask them why their fees were not displayed in a prominent position within their office, or why the full amount was not disclosed to me when I asked. I have requested a refund and I am waiting for a reply. I will update you on my next monthly income report. I hope you found this useful. Please leave a comment below if you have any questions, recommendations or advice about my September 2015 income report.